Bad UI will tarnish every good game design decision you’ve ever made about your game. So, you’ve finally finished your game. It has well-thought-out gameplay mechanics that you perfected by talking it out (to yourself in the shower). You didn’t even know you were so clever until you started writing dialogue for your characters, now maybe you can leave coding behind and be a game writer? Maybe write for Conan? Yeah, totally. Now, you did spend way too much time running around with a sound recorder near your parents swimming pool to get that raw water sound you needed for that one level, but the sound design is superb you must say. You finally figured out Photoshop well enough to know that those filters are meant to be used by people that know what those settings mean, and who intentionally change them to make something interesting, not just willy nilly changing settings til something doesn’t look awful. And as best you can tell, your code was 100% bug-free when you uploaded it. You’re a gaming success story and tomorrow you’re sure all your indie game heroes will be emailing you. “They’re not just stupid games now are they, dad!” you’ll get to yell on the phone, self-righteous, vindicated by your success. But… you overlooked one tiny, massive thing. The UI. The reviews start rolling in. “…had to wait through a whole minute of intros and story before the main menu. A minute! For a flash game!” Well, there were a few logo animations I really had to have for the sites I posted it on, and I wanted the user to hear the clever story intro I wrote right up front at the beginning. “…no info/feedback on what specific upgrades actually do for the player, you can level up “Gold” but what does that mean…” It’s goooold you idiot! More points means more gold! “…no mute button… have to leave the game and go back to the main menu to adjust the sound…” You could just turn it on or off at the beginning of the game before you started, why interrupt the audio while you’re playing. It provides AMBIANCE! “…had to click on every level on the map select screen to see which one to play next…” But.. but.. well, maybe I should’ve done a better job of guiding the player as to which level he/she just unlocked and can play next. You get the point. If you had bad game mechanics, terrible sound design, etc, but had a great UI, it’d be a bad game. If you had great game mechanics, great sound design, but had bad UI, it still might be a great game, but you’re punishing the player for playing and most likely people will see it as a bad game. You already got the point, I’m preaching to the choir. And why am I preaching anyways? Get back to swabbin’ th’ deck, ye codemonkey! A quick note on this post, I’ve broken this post into 2 (more) parts. UI Menu Components (sub-part 1) and UI Game Components (sub-part 2). So there’s a whole new post about the UI components I use in the game itself coming in the next few days! If you happen to read this before the other post is done, I should have it finished by friday. These UI posts take a bit more writing and images and stuff, but I’ll have all the component code shared with you by the end of the week, thanks! Now, some of those example ‘reviews’ above deal more with UX (User Experience) than UI (User Interface), but that’s a whole different blog post. Or a whole different thesis. Being a coder, I’m going to approach UI from a very methodical standpoint of “I have a problem, I need to fix the problem, here’s your solution and it may or may not have an adequately tied bow on it, but it is a solution.” This whole tutorial series has been more or less my approach to creating a TD game, so we’ll continue that trend with my approach to UI. Remember, this is not a UI expert writing this, nor an artist. 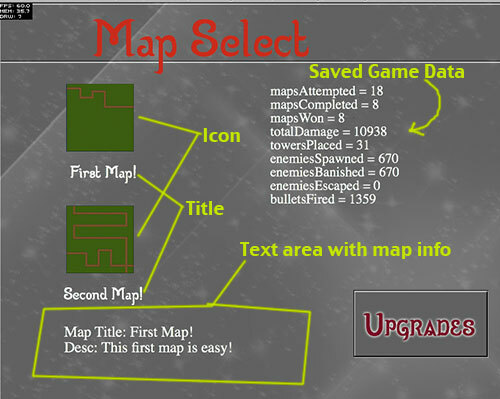 As a player, on the main menu screen, I want to be able to create a new game, load a saved game and delete a saved game. This is a wide open problem with a large number of solutions. I won’t go into all the ones I didn’t choose, but here’s the way I went. The Solution: I want a single class to handle the logic for this. I need a “New Game” image, a “Load Game” image, a “Delete Game” image. I arbitrarily narrowed the requirements down to the player having 3 “game slots” so they could have 3 different saved games at a time. Each “game slot” (I’m going to drop the quotes now, we’re all adults here)… each game slot will have it’s own instance of this class. For each game slot, if there is no data saved in the slot, display the “New Game” Texture on the Button. If there is saved data in the slot, show the Load Game Texture and also enable a Delete button so the user can delete their saved game. If the user clicks the delete button, I also need a way to warn the player that deleting game data is forever and they may cry if they say yes (<--- Not done in the actual demo but mandatory in your game!!). Here are my two button images (hell yeah, beveling and outer glow! I’m gonna take these skills and FrontPage and have the most awesome geocities account in all the WWW!). And here, you can see the two different states the button could be in. The delete button is below the Load Game button and isn’t visible or clickable on the New Game button slot. Above the buttons you can see the game slot name. Now we’ll look at the code and go through programmatically what’s going on here. Line 30-31 – taking params passed in and setting them locally. _gameName is the text you see in the image above that says “Game 1” and “Game 2” and the _gameId is “game1” and “game2” respectively. Line 43 – create a new Signal for onGameSelected. We’ll dispatch that Signal when the player clicks on this button to let the main game know that this is the game the player has chosen to Start/Continue. Line 54 – if the game does exist, give the user a way to clear their game data. Call the addDeleteGameBtn(). Line 93 – calling createGameData with this gameId means that we overwrite any other game data that was there. UI Note: make sure you add something here that confirms with the player if they really want to delete their saved game or not! This is a few extra functions, a few extra words that I did not do for the demo, but YOU SHOULD for your game. Line 95-99 – there is probably a much smarter way to do this. I am removing the “Load Game” button, disposing of it, creating a whole new button with the “New Game” texture, and adding it to this Sprite. Surely there’s a better way, like just updating the Button texture. Line 102-105 – when the New/Load game button gets clicked, set the current game data, and dispatch the Signal that this game was selected. Line 107 – checks to see if the Object that gets passed in is empty, or if it has significant saved data on it. Now, right off the bat, there is some dumb stuff going on here. Can you spot it? When the Button needs to change it’s Texture, I have to destroy it, create a whole new Button passing in the new texture, and handle removing and readding event listeners. That’s nuts. I should just be able to update change the Button Texture and be done with it. But we can’t. However, I found this helpful post on the Starling Forums on a Multi-State Button that you might find helpful. So, having to remove listeners, destroy the button, create a new Button and add new listeners is a pain, but lets weigh this against how often a player will be deleting their saved game data, and the fact that this is not part of the update-heavy Play State where every cycle and every tick and every saved render really counts. So this works and I’ll leave it like that for now. Continuing the trend of purely functional, I use a single shrunk-down screenshot of each Map the user can play as the clickable button. When they hover over the image, they get a useless description of the map. And they can click the image to select the map and begin playing. Remember again that, as a hypocrite, I am showing you really terrible UI while telling you how you should have good UI. Most likely you would have a game map or something in the screen’s background, and these individual icons would be a lot smaller. Maybe they’d represent towns on the map, or countries, or just Level 1, Level 2… Either way, displaying good information about each map is a real boon to the player. You may keep track of and display things like: previous high score, summary of enemy waves, presence of epic boss at the end of the map, modifiers existing on that map (‘raining so -10%range/damage to archer towers’), number of lives the player gets on the map, etc. I always love popovers/tooltips as a way of receiving valuable, contextual information about something I am hovering over. But that’s just me. So the following two tiny images are loaded into the game and represent the Map 1 and Map 2 icons. Below when I refer to the “map data” that gets passed in, I am referring to a new file that I don’t think I’ve gone over yet. We’ll look at this new JSON file now. This is from src/assets/json/maps/mapSelectData.json. "desc": "This first map is easy!" "desc": "This second map is also easy!" It contains the list of maps and their map data for the MapSelect State. The “title” and “desc” attributes can be seen above. For the majority of cases, you would have the same types of icons for this map select screen used over and over. I.e. Town icon disabled, town icon enabled, town icon completed, etc. In my demo, I happen to use screenshots of the maps which, upon looking at this file, would go great in here. An attribute for which “iconImage” to use or something. However, I didn’t do that, and instead I’m passing in the texture I want for the button from the MapSelect State class when I initialize the MapSelectIcon’s class. Alrighty… now, on to the code! Line 26 – for the _icon, create a new Image using the textureName that gets passed in. Pass that name along to the getTexture function and make me an Image! Line 34-35 – make new Signals that dispatch an Object as data. Line 62-63 – if the player hovers over this Sprite, dispatch the onHover Signal with the map _data. This data then gets displayed in a textarea-like component on the MapSelect State. As a player, in the Play State, I need to be able to access game options to change sound settings. In the game, I’ve got a very dinky “Options” Button in the top right corner. When the player clicks it, the GameOptionsPanel slides into view and lets the player change Music and SFX volume. These get saved to their main SharedObject data so once the player sets the sound volume, if they load any of the 3 game slots, or creates a new game in any of those slots, the sound settings persist. I don’t think a user would want different sound volumes for different games. That’s an assumption I made that may not be entirely user-friendly. If multiple people are playing on the same computer and they play different games, they may want different sound settings. It’s a chance I’m taking that really isn’t all that costly to have individual sound volumes for each game slot, but, this is the way I set it up. As you can see, there is a separate volume control for the music volume and the SFX volume. Currently in the demo, since I don’t have any music playing, I simply run everything on the SFX volume, but were I to add music, I would just choose for the volume param to come from the Music Volume setting and not the SFX Volume. There is also a Quit Button here that lets the player quit out to the map select state. 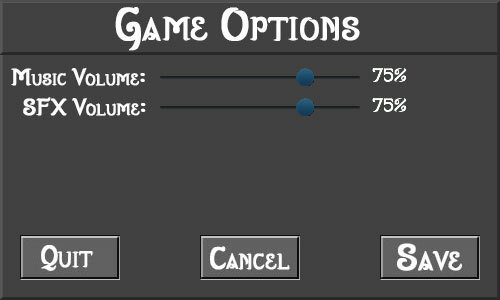 If the player clicks Cancel, no options are updated, and if the player clicks Save then we take the values of each of those volume settings and save them. Line 44-45 – I pass in two points, the startPos (position) Point and the endPos (position) Point. I set those locally here. This is basically where the top-left corner of this Sprite is going to start (somewhere out of view) and where it will end (somewhere in the center of the screen). I use the TweenLite lib to move the panel from the startPos to the endPos which we’ll see later. Line 47-49 – set up my Signals for when the panel gets activated, deactivated, and when the player clicks the Quit button. Line 51 – add the addedToStage listener so I don’t try to do anything until the panel is actually on the stage. Line 55 – the panel has been added to stage, so remove the listener. Line 62-63 – set the minimum and maximum value to 0 and 100 respectively. Note: AS3 volume values are always from 0 to 1. So later we’ll be converting 0-100 down to 0-1. Line 64 – set the default value to the Config.musicVolume (0.75 by default) times 100 to get 75, so the initial default value of this slider would be 75. Line 65 – “step” lets me set how I want this slider to behave. I set the step value to 1, so when you drag the slider thumb, you can set it to any integer value between 0 and 1. If I set step to 5, then I could set the volume to values like 0, 5, 10, 15…95, 100. Line 66 – “page” is a lot like step, but it’s for when the player clicks the bar to the left or right of the thumb. So setting the page to 10 means that if the player’s volume is 75, and I click to the left of the thumb, the value will jump down 10 so it will now be 65. If I clicked again, it would be 55. Line 84-98 – I’m adding two TextFields, these will have the percent values of the volume, so by default, the text for both would be “75%”. We’ll look at the _getPercentText() later but that basically is what converts 0.75 into “75%”. The text that says “Music Volume:” and “SFX Volume:” are actually on the background image… I cheated 😀 But those could be TextFields just as well and added just like this. Line 100-113 – creating my three buttons, Save, Cancel, and Quit. I pass the new Button() the appropriate texture file to use for the button, set its x/y, then add it to this Sprite. Line 117-118 – starting off, I want this options panel to remain invisible, and the panel itself will always be touchable = false so the player can’t actually click the panel background image. Look into setting Sprites to touchable = false; if you will not be interacting with them. This is an optimization technique that will save you a little bit here and there. Line 1-6 – init() gets called by the activate() function a few lines down. This function initializes the volume variables from Config settings, and tells the _musicSlider and _sfxSlider what their value should be. This inits my sliders with the latest Config values basically, in case they got set via a different options panel or something somewhere else in the game (mute button or something). Line 36-39 – called when the Quit button is clicked, we want to deactivate() the panel and then dispatch that the player clicked the quit button so we need to quit thte game. Line 43 – get the slider.value and divide by 100. The slider.value will be between 0-100 and we need a value of 0-1 for the volume. So val then easily becomes 0-1 after we divide. Line 58 – this function takes a Number which will be from 0-1, multiplies it times 100 and makes a String out of it, then adds the % so you get nice pretty “75%” text. You have to typecast to int() because sometimes you will end up with “74.9934536534%” if you don’t. Line 66-68 – called when the deactivate tween finishes and the panel is off the screen, set visible to false to hide it, set touchable to false to keep Starling from thinking players can click off the stage somehow, and dispatch the onDeactivated Signal. Line 71-85 – these two functions simply add or remove event listeners from all the Objects on the panel that need events listened to. As a player, on the Upgrade screen, I want to see how many upgrade points I have, the different options that I can upgrade, and I want to be able to add or remove to those points at any time. I also want a “Reset” button so if I’ve added a lot of points, I can ‘clear the board’ and start allocating points from 0. So, I wanted to hit the core points of the problem. Currently the Feathers NumericStepper is in beta, so it’s not actually available for me to use here. I was bummed about that. So I’ll make my own in a way. So I needed art assets: a + and – button with enabled and disabled states, and I wanted something that showed off that I was “putting points into it” so I went with the following that I drew all by myself!! In order from Left to Right: upgrade_add_disabled.png, upgrade_add_enabled.png, upgrade_rank_notselected.png, upgrade_rank_selected.png, upgrade_sub_disabled.png, upgrade_sub_enabled.png. And here we can see them in the game screen. Available Points are displayed in the upper right with the reset button, and to the left we’ve got our actual UpgradeOptions.as component. 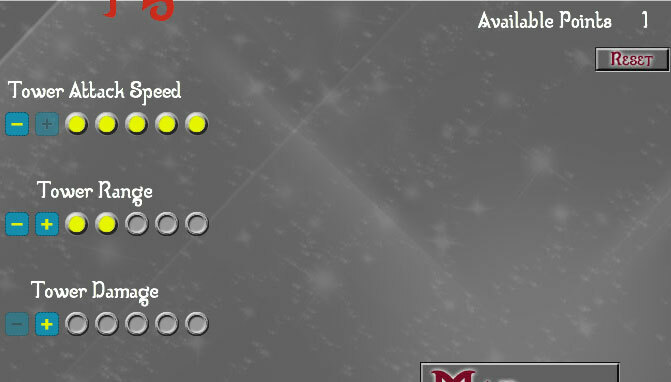 It’s made up of a text field with the name of the upgrade, a minus button, a plus button, and 5 ‘ranks’ that can be filled up. Tragically missing from this design, which you should implement in your game, is what each point in each rank actually does for you. This is not documented anywhere, but right now, each point you put into Tower Attack Speed decreases time by 10%, Tower Range gets you a 15% range boost for the tower, and Tower Damage gives you 20% per rank. These should be built into the UI in a helpful way so the player always knows the cost of each decision. Now let’s look at the code from com.zf.ui.upgradeOption.UpgradeOption.as. It basically handles creating a reusable UI component where we can pass in a few params and create those three “Tower Attack Speed”, “Tower Range” and “Tower Damage components. Line 34 – optionChanged Signal lets me dispatch out when a player has clicked a + or – button and the value of this option has changed. Line 1-54 – these next two functions _addPlusButton() and _addMinusButton() are perfect candidates for some easy refactoring at a later date. I don’t know why I didn’t do this to start with, but here we are. These are essentially the exact same functions but they just have a few differences in the texture names to use, the name of the button, and the x value. I’ll go through the first function and you can apply those to the second. Oh, and some logic on how it enables/disables itself. Line 68-73 – check the name of the Button, if it’s ‘add’, then increment _currentRanks and set addedRank to true, otherwise decrement _currentRanks and leave addedRank to false. Line 79-94 – boring standard destroy() function except for 83-87 where we loop through the _ranks images, remove them from this Sprite, remove them from the _ranks array and null them out. All of the other work is handled by the Upgrades State which we’ll look at another time. Feel free to check out the finished product of my AS3 Starling TD Demo.